Just days after over 1,600 reptiles and amphibians being smuggled to the U.S. at an airport in South Africa, more animals have been found, this time at Heathrow Airport in London. The 13 rare iguanas were found stuffed in socks in the luggage of two Romanian women who had come from the Bahamas and were promptly arrested, according to the Guardian. 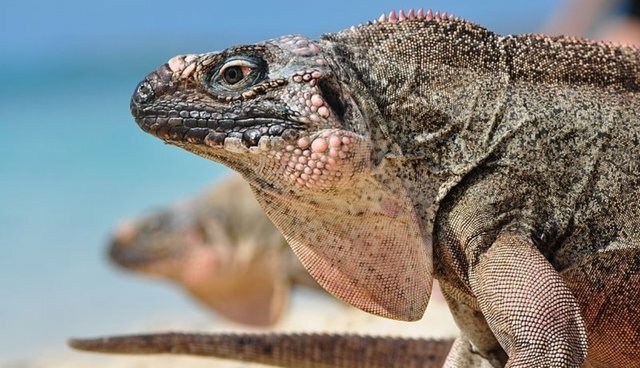 They were due to take the San Salvador rock iguanas -- which are native to the Bahamas and classed as being under threat of extinction -- on to Düsseldorf in Germany. Each one of the creatures was wrapped in a sock; 12 survived the journey, while one died. "This particular species of iguana is incredibly rare -- only a few hundred are believed to be left in existence -- so this was a remarkable and very important seizure," Grant Miller, an official from the country's Border Force's endangered species team told the Guardian. He added, "The surviving animals were dehydrated and are now under the supervision of a specialist vet. We are also working with experts to find the best way to protect and safeguard these endangered creatures longer term." The exotic pet trade is a major problem for rare species around the world -- both for animals that suffer during transport and in captivity, and for humans. According to the Centers for Disease Control, about three of every four emerging infectious diseases in humans originate in wildlife. More than 210 million animals enter the country legally every year, 300 million more come in illegally. And most people have no idea -- Dr. Anthony Pliny of the The Center for Avian and Exotic Medicine told The Huffington Post, "I think most people are oblivious to how serious the illegal pet trade is and how much it still happens, and how it may represent sources of contagion."